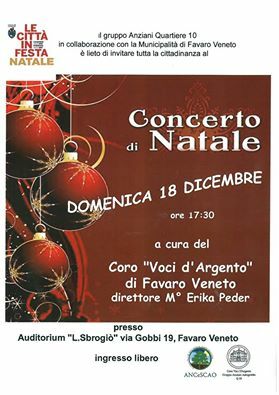 Christmas concert at Auditorium "L. Sbrogiò"
Sunday December 18 at 5.30 pm Gruppo Anziani Quartiere 10 presents the Christmas concert by Voci d'Argento Choir, conductor M° Erika Peder. The concert will take place at Auditorium "L. Sbrogiò", via Gobbi 19, Favaro Veneto. Sunday December 18 5.30 pm at Auditorium "L. Sbrogiò"